At Whisky Live Singapore 2018, there were a few choice Gordon & MacPhail whiskies available in the VIP section. It provided a great opportunity to sample fine whiskies – particularly aged drams one could ordinarily not afford. We spotted this when we first perused what was available and knew we must try it. We were fortunate there were still a few drops left! It is such a treat to try something aged and beautifully peated. While it was only a small snifter, it was more than enough to know we were lucky to have such an opportunity. And what would this set you back? While the 33 year was not on sale, the 34 year old was retailing for SGD 1,100. Yikes! 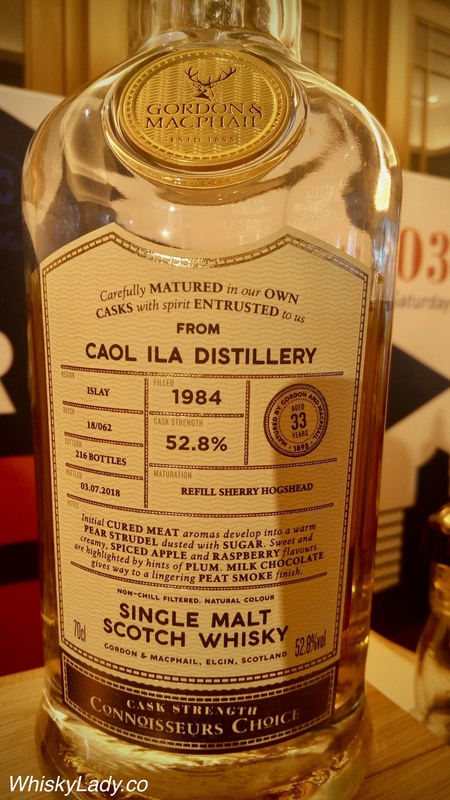 This entry was posted in Cask Strength, Islay, Peat, Scotland and tagged Caol Ila, Caol Ila 33 year, Gordon and Macphail by Carissa Hickling. Bookmark the permalink. I never run into this kind of old whisky here in my city. What would you advice me to do in order to be able to try these kinds of drams? Aside from hop on a plane? I also ordinarily have no such opportunities in Mumbai, India so need to head to events like Whisky Live in Singapore!